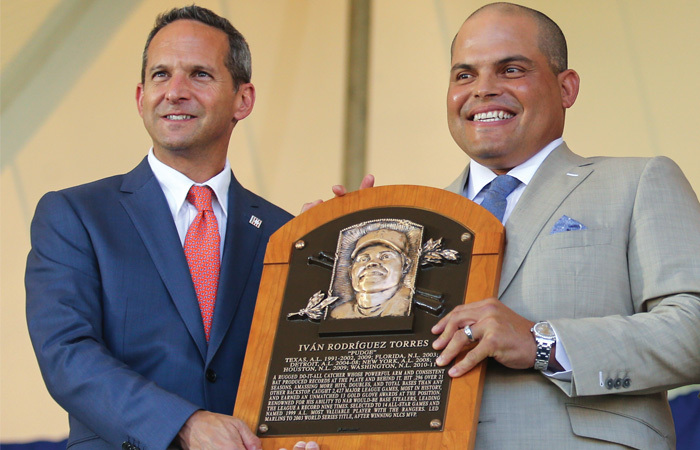 Ivan “Pudge” Rodriguez played 21 seasons in the Major Leagues. During his playing career, he played in 2,543 games, amassed 311 home runs, 1,332 RBI and hit .296. He won the MVP in 1999 with the Texas Rangers and was a 14-time All Star. 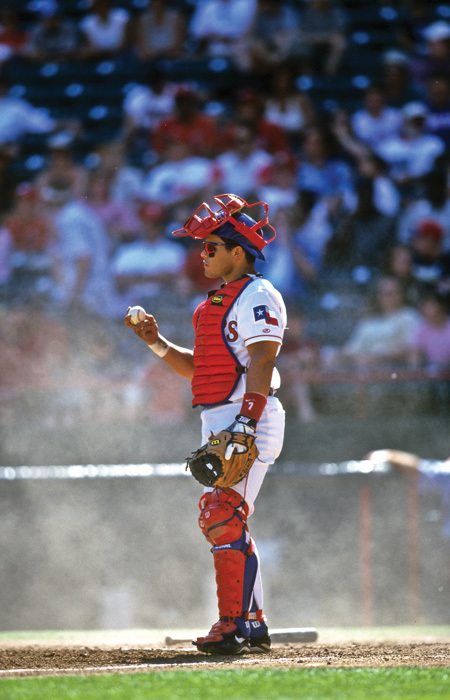 On top of all the offensive honors and accolades, Pudge was a defensive prodigy, winning the Gold Glove 13 times. He was one of the most feared defensive catchers in the history of the game, gunning down would be base-stealers at a ridiculous clip. Widely regarded as one of the best catchers in Major League history, Pudge got a World Series ring in 2003 with the Florida Marlins. In addition, Pudge loves the game of golf. He last sat down with AG back in July of 2014 and spoke fondly of the game he has grown to love. A lot has changed since then for Pudge. His No. 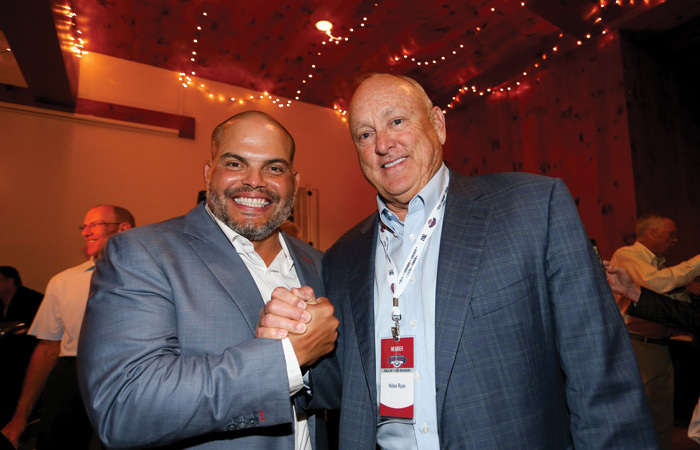 7 was officially retired by the Rangers, he was selected to the National Baseball Hall of Fame his first time on the ballot and he’s entered into a new business venture, Pudge’s Pizza inside the new Texas LIVE! development adjacent to the construction site that will eventually become Globe Life Field, the new home of the franchise he played for the majority of his career. 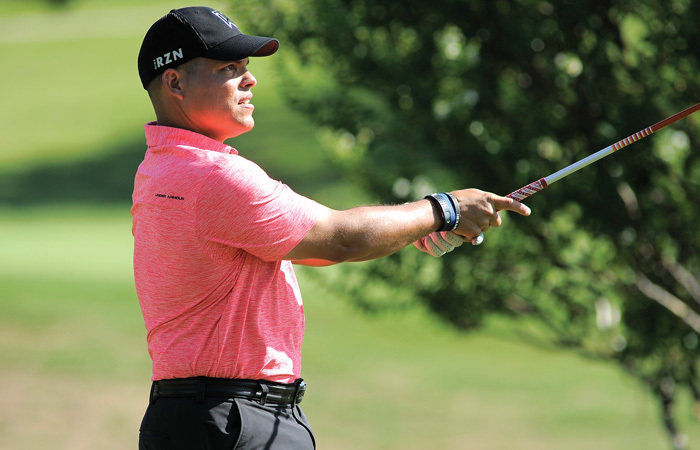 In our latest visit with the Hall of Famer, AVIDGOLFER talks about his memories of the Ballpark, the Major League debut of his son Dereck, his induction into the Hall of Fame, and his thoughts on the new Texas Rangers Golf Club. You’ve been staying busy since the last time we spoke with you in 2014. You’ve been inducted into the National Baseball Hall of Fame, opened Pudge’s Pizza at Texas LIVE!, and even dipped your toes into some broadcasting for the Rangers. What keeps you so active? Yes, it has been very busy, but I love every minute of it! I have always enjoyed being active, I think it goes back to my playing career, I have always enjoyed doing multiple things at once. Also, I miss the contact with fans and being able to connect to people after my retirement, it is always nice to see what people have to say to you and how we all have so much in common; so yeah, staying busy is the way to go! Speaking of Cooperstown, what were your initial thoughts when you first got the call that you had been elected to the Hall of Fame class of 2017? It was a dream come true, I mean being able to make it to the HOF is every athlete’s goal. You want to make sure you do your best every day in and out and being able to see that people recognize that is an amazing feeling. Also, the fact that I was able to make it on my first ballot was pretty special too. Being right there next to my hero Johnny Bench makes me feel that I did something kind of okay. But I never forget that I made it here thanks to God, my family, close friends and all the organizations I played for. You’ve done some broadcasting on Fox Sports Southwest. What do you enjoy the most about being an analyst, especially seeing as you’re doing it for the team you played the majority of your career for? Listen, I love baseball, and if I can talk about it then it’s better! Baseball it’s my passion and I love to try to share my knowledge on TV with my fans and the people that love baseball. I also enjoy being able to be myself and people seeing me as a person and not as a professional baseball player. At the end of the day we are all humans and have a lot in common, so I like to share this with the people. Thanks to Fox Sports Southwest for giving me the opportunity and for the Rangers for giving me multiple ways to connect with the fans! Ever have to bite your tongue on the postgame show about an in-game managerial decision you disagreed with? Yeah, it always happens, but I respect everybody’s opinion and everybody’s perspective about the game, but sometimes it’s hard to keep it all to yourself. Since we’re talking about managers, there has been a recent trend in Major League Baseball of franchises hiring skippers who are younger, bilingual and seem to connect more with current rosters. Ever thought about returning to the dugout as a manager? Ever been contacted about interviewing for an open job? I have thought about it, I love connecting to young players and trying to make a difference in their career, that’s why I work with the minor league teams with the Rangers; Maybe at some point I will be ready to manage but now is not the time. I want to keep doing different things, different hobbies and spend more time with the family. You played in the Major’s for 21 seasons. Give us your top three most difficult guys to cut down trying to steal a base, and your top three most difficult pitchers you had to step in the batter’s box against. Tough question. All these professional baseball players are great, they are all great because they play at the highest level so they are all fast, accurate, complete athletes. There were multiple players that I played against that were tough, but they were all GREAT! You managed to stay pretty healthy during your career, but now that you’re retired, are you seeing any negative impact on your body from all those years crouching behind the dish? I still try to stay very active. I try to work out 5 times a week and play golf at least 3 times a week, I don’t have any pain in my knees or anything! I do get sore sometimes in my back, but I think if you are disciplined and stay active then you will be in good shape. Your son Dereck is a pitcher for the Giants. How much fun has it been to see him grow up around the game and now see him playing in the bigs? I mean it’s unbelievable, this is one of the most exciting things I have ever done. Sitting there watching him pitch, and seeing his confidence and what an amazing baseball player he has turned into is an amazing experience. Nothing could make me prouder and I’m so excited for his future as a pitcher and also very happy to see the great man he has become. He is getting married in November in Puerto Rico and I can’t wait to see him on his wedding day. What was the one piece of advice you gave him before his Major League debut? To go out there and believe in himself. He has done great work and worked out hard. If you go out and do things the right way every day it will pay off. He needs to stay healthy and keep working hard on what makes him better every day. Discipline and great work ethic will take you far in life. 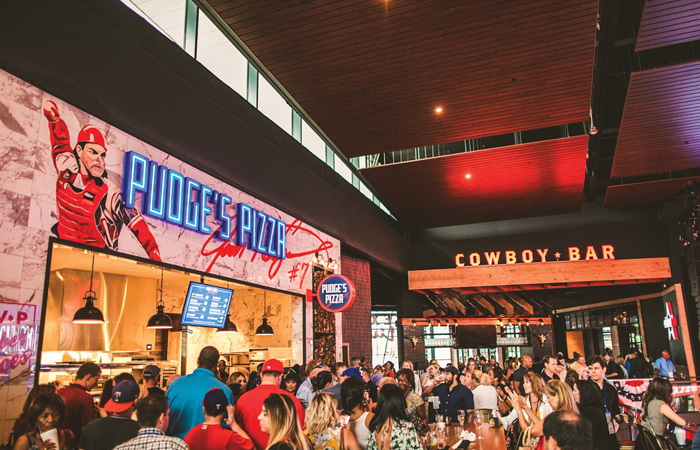 You recently opened Pudge’s Pizza in the new Texas LIVE! and it’s been a tremendous success. Who approached you about that concept and why did you feel like it would be something you would want to be a part of? The Rangers and the Cordish family approached me to get involved in this project, and as a businessman I realized this will be a home run, and I got behind it right away. I enjoyed the concept and I know everybody loves pizza. We put a lot of passion behind each pizza and we make sure everybody feels comfortable and happy with the service. I enjoy going out there and seeing the people. I invite everybody to come and try our pizza. You will love it and who knows? Maybe I will see you there. This is the final season at The Ballpark in Arlington. I know you must have infinite memories of playing there, but is there a favorite? Man, there have been too many. I loved going to this ballpark because a huge part of my career was there. I enjoyed the fans there and it brings a lot of good memories, but especially the 1999 year was great for us as team and for me as a player. I will always love that ballpark and it will always have my heart. Globe Life Field opens next year, how do you like the design of the new stadium and do you think a roof could potentially lead to more success for the franchise with more free agents willing to play in Texas now that games won’t be 100 degrees at first pitch? I love the new stadium design. It’s unbelievable what’s going on right now in Arlington. It’s a beautiful thing. All the development that they are building around the ballpark will attract more people to come to the stadium. Also, with the new roof, more players would love to come and play here, because DFW has so much to offer to families, so more players would love to come and play here since the heat won’t be a factor that will affect them anymore at home. We should have an amazing team in the next 2 to 3 years. Of course, this is a golf publication, so we should probably mix in a golf question or two. The new Texas Rangers Golf Club just opened. Did you think you’d ever see a course named after the franchise you played so many years for? I actually went to visit it last August. It is an awesome golf course and I can’t believe we now have our own Texas Rangers Golf Club, it is definitely a beautiful golf course that will bring more people to Arlington as well. You were one of the first to play there before the course even opened. What were your initial thoughts and how did you play? It was a very hot day in August, so my game was ok, but the landscaping there was beautiful and I can’t wait to play it again. What are some of your other favorite places to tee it up? I love every single golf course because just being out with nature is what brings good feelings and memories for me, I enjoy playing the Four Seasons Las Colinas here in DFW, Dallas National, Whispering Pines down in Trinity, La Gorce CC in Miami, Dorado Beach in Puerto Rico and many other courses in the states and Puerto Rico. Have you flexed your Hall of Fame muscles to try to play any courses you may not have been able to get on before? People are very nice when it comes down to helping me to get on different courses. I’m lucky I have met some nice people that always go above and beyond to get me on the better courses. I’m just recently played Torrey Pines Golf Course in San Diego, but yeah I have enjoyed playing golf at many different courses here in the states. Any good courses in Puerto Rico we need to check out? Dorado Beach, Bahia Beach and Coco Beach are awesome golf courses! Do you update your equipment often? Of when you find something that works, do you stick with it a while? I do change equipment often, but I always try to stick with Callaway since they help me with my golf game. Any aces? Where and what hole? I had a hole-in-one down in Miami last year in September!